Detailed karstic water quality monitoring was performed in the Krásnohorská Cave system in the Slovenský kras Mts./Silická planina karstic plateau formed by Triassic limestones. The cave itself is 1550 m long, formed by a huge underground stream that can be followed in more than 400-m-long corridor. Here, two small visible side inlets to the stream are found. Some 100 metres above the cave entrance underground stream disappears in a siphon to emerge on the ground surface as a Buzgó karstic spring (5.3–1355.8 L s−1 discharge). Two other (but smaller) karstic springs are situated on the foot of the same karstic plateau within a distance of 200 m from the Krásnohorská Cave entrance, with yet unknown karstic network behind. 150-m-deep hydrogeological borehole RHV-4, exploited as drinking water source for the neighbouring village, is situated just in front of the Krásnohorská Cave entrance. Water at six monitoring points—both side inlets to the major underground stream and its end point (spring at the cave entrance), as well as smaller side springs and the borehole outside were regularly sampled for chemistry, δ18O, δ2H and tritium content in the period of June 2015–June 2016. Approximate weekly samplings were accompanied by precipitation sampling in the same extent, but in two weeks interval. Surprisingly high stability of karstic groundwater chemical composition was found. Content of dissolved HCO3−, Ca2+, Mg2+, K+, Na+, Cl− and NO3− remained unchanged even in the period of 20-fold raise of discharge of the Buzgó spring during the snowmelt period in February/March 2016. Results of 573 chemical analyses also show a great similarity of karstic groundwater chemical composition at different monitoring points. This was not the case of SO42−. Results of analyses pointed out that one part of the water circulation system is influenced by dissolved sulphates of geogenic origin, very probably occurring in Lower Triassic shales. These were not found in the outcrops in the recharge area, but their strong influence on water chemistry is characteristic. Groundwater flow rates of partial water circuit which is passing shales with sulphates seem to be more stable. Sulphate content is then diluted at high water stages and increases with groundwater depletion in respective monitoring points. Mean values of δ18O and δ2H are very similar at all monitoring points, found in the narrow intervals of −9.48 to −9.04‰ and −64.5 to −61.3‰, respectively. Recharging precipitation in the monitored period was somewhat heavier (−8.77 and −60.6‰) although the altitudinal difference of sampling places was more than 230 m. Comparing individual samplings in time series, δ18O differences may reach the range of 1.47‰ comparing to the 0.44‰ span of mean values (ranges of up to 10.7‰ in individual samplings and 3.2‰ in mean values for δ2H). Time series of δ18O and δ2H therefore point to different patterns/different mean transit times of water circulation at individual monitoring points. 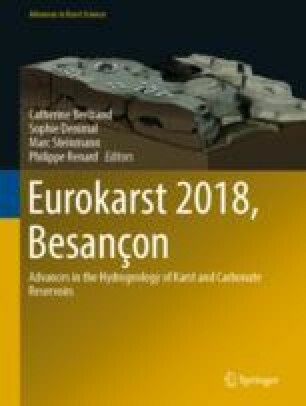 The results of this study could be obtained thanks to the project, coordinated by the European Commission as LIFE11ENV/SK/001023, entitled “Implementation of Sustainable Groundwater Use in the Underground Karst System of the Krásnohorská jaskyňa Cave” (acronym: KRASCAVE). The aim of this the project was to reduce the risk of contamination of drinking water in the underground karst ecosystem Krásnohorská cave through the implementation of innovation activities; the outputs of the project should also serve to reduce the risk of environmental impairment fragile ecosystems, depending on the quantity and quality groundwater. In the KRASCAVE project, the State Geological Institute of Dionýz Štúr Bratislava was acting as coordinating beneficiary and civic association Envi Slovakia Bratislava as associated beneficiaries. In addition to the European Commission, also the Ministry of Environment of Slovak Republic participated in the project co-financing.